Wafa, 26, and her husband Mohammed, 30, of Hebron, have been married for eight years. Like any young couple, they were anxiously looking forward to raising a family together. Sadly, the couple experienced two miscarriages. When Wafa became pregnant a third time, they were thrilled that they would be welcoming a baby girl into their lives. With God’s help, I will be able to give birth to my baby girl, and she will be born healthy, and I know that here in the neonatal intensive care unit they will take very good care of my baby and keep her safe. 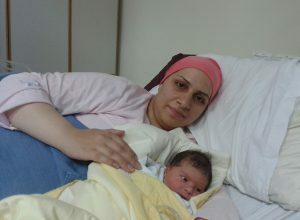 The couple was determined to keep both Wafa and their baby girl healthy and to seek the best medical care. However, as a result of the restrictions on movement and goods within the Bethlehem region, construction jobs are rare for manual laborers like Mohammed; resulting in the young couple not having a steady source of income. 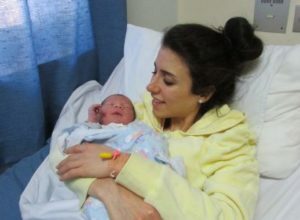 So when Wafa began experiencing complications with her pregnancy at the beginning of her sixth month, they initially went to the public hospital in Hebron. Though Holy Family Hospital is known for its excellent medical care, the couple was afraid they would not be able to afford the costs. At the Hebron public hospital, the doctor’s detected Wafa had a ruptured membrane. Soon both Wafa and the hospital doctors realized that the hospital was not equipped to adequately care for her in this condition. She was immediately transferred to Holy Family Hospital, which is the only hospital in the region that specializes in high-risk pregnancies. “First we went to the public hospital but the nurses there treated me poorly. 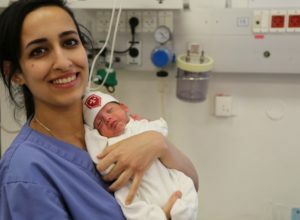 The medical care there was not at the level I needed to keep my baby safe and so I came here,” said Wafa, who was now under strict observation by the Holy Family Hospital doctors. The staff at Holy Family Hospital has been most kind and understanding, she added. “Here we respect the patients. We respect their will, we respect their dignity,” noted a hospital social worker Mary Maoh who has been following Wafa’s case. Twice a day the staff performs a CTG scan on Wafa to monitor the heartbeat and health of her baby and to ascertain that it is not under duress. In addition, blood tests are given to Wafa daily. The doctors are hoping to be able to keep Wafa under observation for another two to three weeks, noted Maoh, until the baby is big enough to be safely delivered with a cesarean section. The extended hospitalization for Wafa and the need for a cesarean section have put the young couple under extreme financial stress, stated Maoh. Thanks to the generous donations of supporters of the Hospital they will be able to help the couple with part of the costs for both procedures, she said, thus removing the financial anxiety from their minds as they eagerly await the birth of their first child.